Is there a more thoroughly divisive (and perplexing) area in music-making than compression? Many a guitarist will have purchased a pedal, fastened it onto their board and, after a few knob tweaks, found that it somehow made their sound miraculously, indefinably ‘better’, and left it at that. But what’s happening when your signal is compressed? Well, if used correctly, a compression pedal can completely revolutionise your guitar-playing setup and, most importantly, make you re-evaluate the way you approach your instrument. Compression, in simple terms, affects your overall volume by reigning in the louder notes, chords and pretty much any sharp, shrill or loud sounds that you might generate when playing. It does this by applying a preset threshold on just how loud you can get with your guitar before the circuitry kicks in and reduces the volume. The rate and length of compression, and any additional volume gain you want to add to the signal after it has been compressed, are usually all modifiable on your pedal. It can also equalise the sound, so that the quieter and louder elements are the same volume. Compression can also disguise some of the mishaps that befall players who are perhaps a little sloppy when moving between chords or notes by totally eliminating unexpected loud overspill from other strings and generally making everything sound extra-tight, even if your attack is variable. As any guitarist with a compression pedal will tell you, this can be incredibly useful in a live context. Especially if you’re sharing amplification (as many gigging amateur guitarists are) or using a high-headroom amp without much natural compression – often referred to as ‘sag’ – of its own. Certain rhythm-oriented genres, such as reggae and funk, rely on compression to maintain that slick and smooth pulse. The choppy and kinetic playing styles of Nile Rodgers, Al McKay and others of that ilk would sound very different without liberal use of the compressor to keep the sound at an equal level. The same can be said of folk and country players, who use it to solidify arpeggiated fingerpicking, often upping their output gain so the quieter moments are boosted. Although there is a vast range of different types of compression pedals, most will have the same controls and modifiers; these include threshold (or level), attack/release, ratio and output gain. Threshold controls how loud your signal needs to become before the compressor kicks in and reduces the volume. This is usually measured in decibels. Attack modifies the time delay between the signal hitting the threshold before being compressed, creating more ‘impact’, while release controls how long the sound is compressed before the signal is let go. These require careful manipulation to achieve the required balance for your sound, and there’s no ‘right’ level – it’s all part of the creative fun! Some pedal manufacturers don’t enable the attack and release to be modified, however, as the way these controls are ‘voiced’ in that regard may be the sonic signature of their pedals. Ratio controls just how much the signal is compressed, and when set to a very high level it will not allow any signal that exceeds the threshold level to go past, which can result in the unpleasant side effect of a very flat sound if over-used. 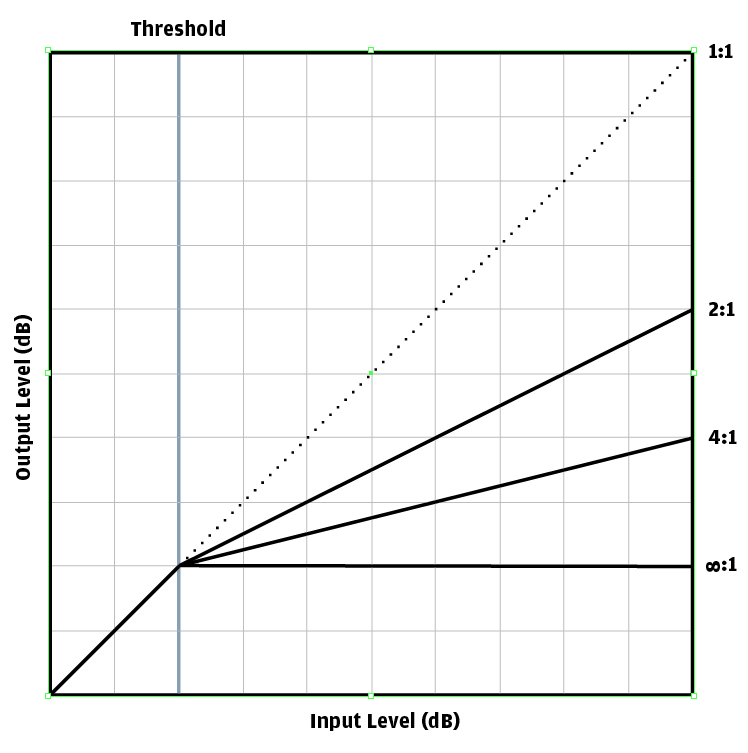 For example, a ratio of 4:1 simply means that any audio signal exceeding 4dB will be reduced to 1dB when it is output. Output gain can boost your tone by adding extra gain to the signal after the compression has taken place. This can make every sound normalise at a much louder volume – if you want to have more dynamic variety in your playing before getting loud, proceed with caution! Most users keep their compressors at the start of the signal chain, before distortion, chorus and all the rest. This way, the pedal can process the full, unmanipulated range of the signal from the guitar before it is altered by further effects, some of which (such as distortion) affect the signal so that it peaks artificially, or add their own inherent compression characteristics to the sounds. The end result of all these settings is one that may appear somewhat counter-productive – to the audience, the effect should be transparent, so although you may have spent bloody ages getting exactly the right threshold, ratio and output gain settings, the punters out front shouldn’t be aware of anything too dramatic happening to the sound, (eg, it sounding squashed). Their ears should perceive a dynamic, crisp and aurally pleasing guitar tone. Compared to the recording studio, with eternally adjustable plugins working in conjunction with rackmounted analogue compressors full of dials and switches, a simple guitar compression pedal can seem somewhat flimsy, yet fundamentally they do exactly the same job. However, in a studio setting, compressors need to be completely scalable so they can be used on a variety of different instruments and, of course, the ever dynamically-unreliable human voice. Guitar and bass pedal manufacturers have been crafting their wares for a long time, and there are many standouts. 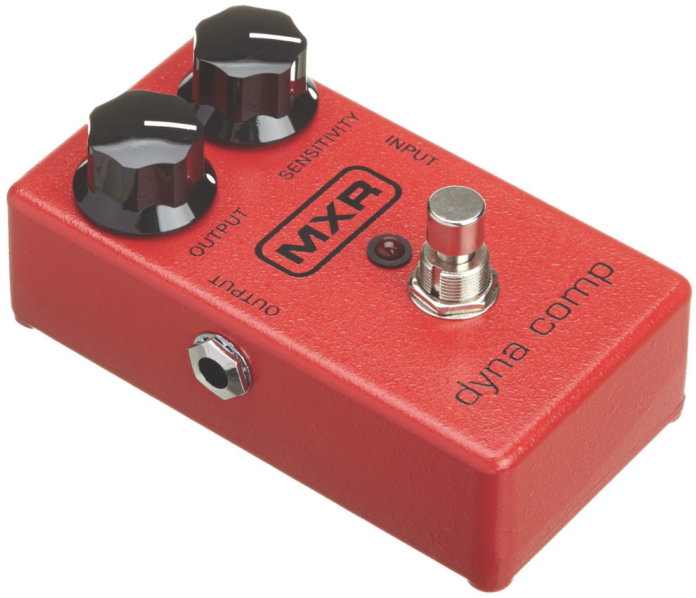 Worth mentioning for historical significance is the MXR Dyna Comp, which has been on sale since the 1970s and is seen as something of a benchmark compression pedal, with its own unique sonic flavour. The Dyna Comp became a hot favourite of the Nashville country scene for its ability to thicken up the occasionally thin tones of single-coil guitars, and it’s been used by such luminaries as Dave Gilmour, The Edge and Adrian Belew, too. The Dyna Comp also bred a range of imitators, and ‘improvers’ – one brand that many compression pedal enthusiasts will go all gooey at the knees for is Ross, which – as legend has it – refined the MXR blueprint by adding stabilising capacitors that control the compression more effectively. The Ross unit also allowed you to achieve unparalleled sustain. They’re incredibly rare these days, with many enthusiasts building their own cloned versions, but some originals can be found if you trawl the internet for long enough! 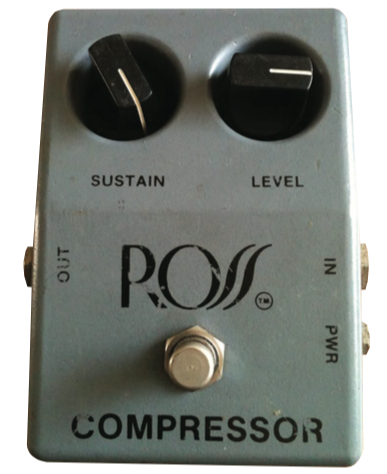 Use of compression is (like many aspects of the effects pedal world) hotly debated, with some claiming that it removes unique character from their well-honed rig and dulls their tone, and on occasion (depending on the quality of the pedal you’re using) adds unwanted hiss by raising the noise floor. While it’s true that using a compressor in the extreme can flatten and de-energise certain instruments, in a live context when used correctly, it can cement your sound, equalising otherwise erratic dynamics and adding an unmistakable polish, both to your tone and the overall band mix. Looking for a compressor? Check out our guide on the best compressor pedals here.